In an episode extremely similar to the TOS episode "The Naked Time," the Enterprise crew falls victim to an infection that acts like alcohol, causing all sorts of chaos that nearly results in the ship's destruction. Also, Lieutenant Commander Data gets laid. I'm an English major and occasional grammar Nazi, but I don't understand what the semantical difference is between being "sucked out" versus "blown out" into space. Riker orders Data to do a search of Starfleet records concerning "somebody, somewhere," taking a shower in his or her clothing. Despite it being awfully vague, I can't imagine how it could possibly take Data a couple of hours. It only took me a few seconds on Google to find the TOS episode in which it happens. This episode is called "The Naked Now," and in it, people get naked. Coincidence? Why exactly does Wesley need a device that mimicks Picard's voice giving him orders? Dare I ask what he uses it for? I'm with Data when he asks Picard: "Snootful?" What's a snootful? I never understood why Data isn't immune from the "disease," but now that I'm older, I think his intoxication is the result of something else entirely: the loss of his virginity. Data quoting Shylock to Captain Picard = priceless. Gates McFadden (Dr. Crusher) is the only actor who pulls off being intoxicated. Wow, the visual effects are bad. I think Worf wants to kill Wesley. "It never happened." I don't care if you have no emotions, that's gotta sting! The transporter's "maximum decontamination" doesn't work so well. I fail to see how it's an improvement over the quarantine in ENT. 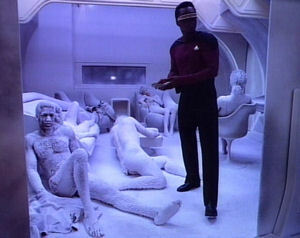 Then again, I have no interest in watching a half-naked Data, Geordi, and Riker rub gel all over each other. Poor Data never gets over her. Ah, Engineering Chief MacDougal. We barely get to know you.